When taking samples for specific purposes, it may be necessary to have a different plan for each intention. Discrete and composite samples serve different purposes in showing what happens at a single point or over a time span. Sampling over a longer time period such as a day should have a plan outlined prior to taking any samples. A discrete sample is one sample taken from a single point, at a specific time; this type of sample is also called a ‘grab’ sample. A composite sample is collected by combining grab samples from one location at different times, or samples from different locations at the same time and combined. Where discrete samples provide data from a snap shot in time, a composite sample can provide data spread throughout a day. Figures 1 and 2 show examples of how each type of samples are used. 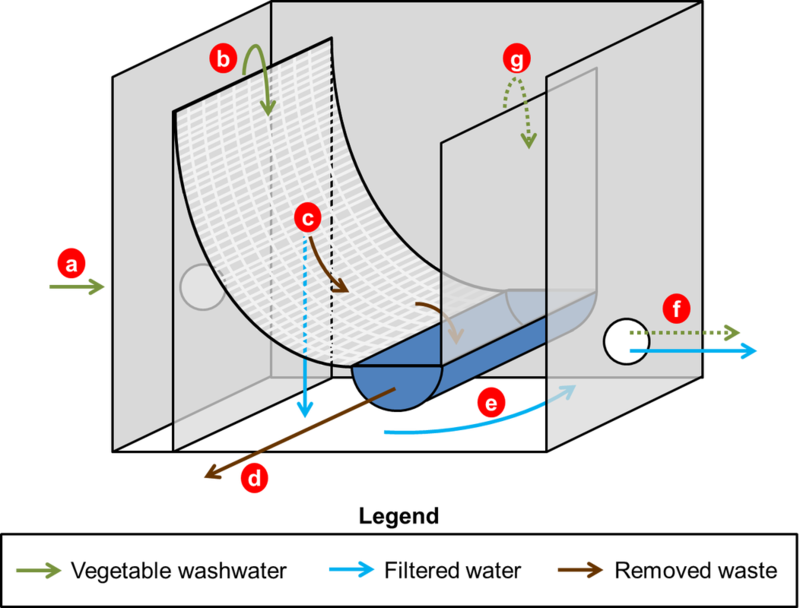 Figure 1: Discrete samples are taken from the inlet pipe, at the overflow points of two cells of a settling tank, and at the outlet pipe. Figure 2: A composite sample is taken from the inlet and outlet pipe in a settling tank; samples are taken at several times and grouped together in one bottle submitted to the laboratory. The mass loading of a discharge is a useful tool in selecting and sizing treatment equipment. The calculation is completed by comparing the daily flow rates with values obtained from water quality sampling and analysis. 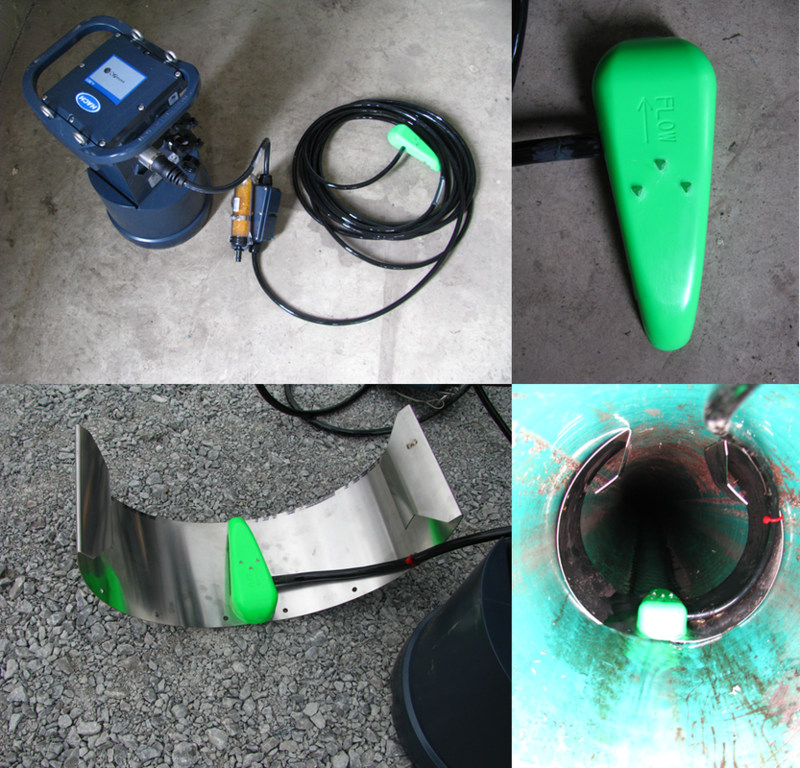 Often times, concentrations of parameters from water quality sampling provide results in mg/L. The flow measurements are recorded in L/min; the official designation for flow in calculations is ‘Q’. 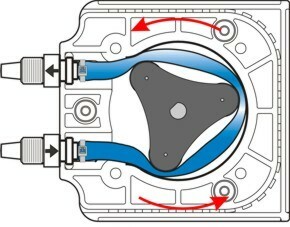 With the addition of the time period of the water, all the variables to calculate mass loading are present. There are multiple methods to reach the final number; two of the possible ways are presented to the right. 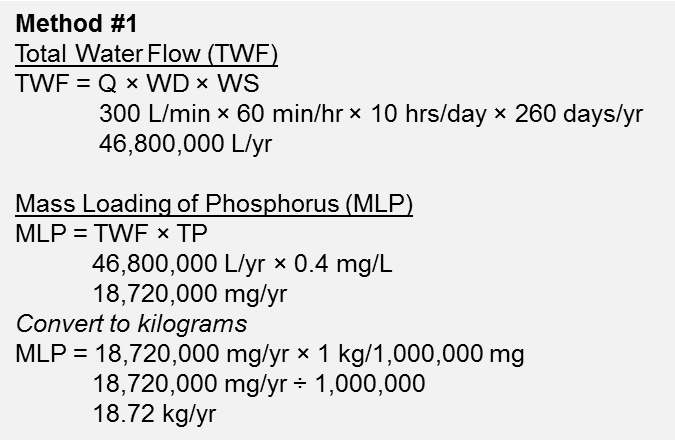 ​Calculating the mass loading of a water stream is vital stage of water characterization. It will be important when creating a treatment system, deciding how to handle the waste stream, and discharging or re-purposing the final water. More information on measuring flows is available in 'Monitoring Discharge Flows'. 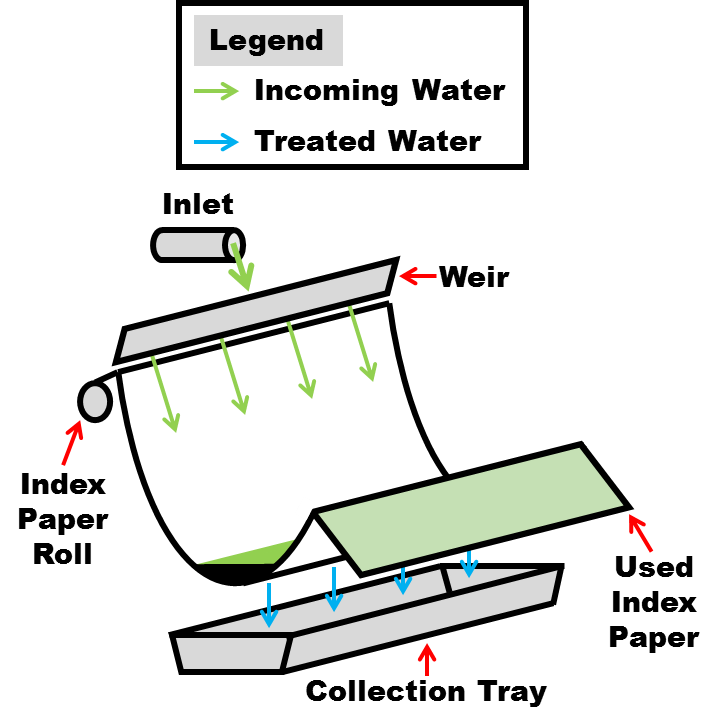 Instructions on sampling procedures can be found in Factsheet #006 Water Sampling & Proper Procedures. Read about how to complete a jar test in ‘The Trouble with Muck: Size’. Throughout the project there have been discussions about the different lengths of time it takes to settle different soil types. In general sand settles the quickest followed by silt, clay, and lastly, muck. To demonstrate this process, jar tests were done with a mineral and muck soil sample. Jar tests are simply soil added to water and left to settle. The depth of the water to the top of the sediment layer was measured as 2 1/8”. ​The test was evaluated by taking pictures of the two jars at regular intervals (Figure 1). Calculations were done to predict when the various soils would settle out of the water, shown in Figure 2. As expected, the order in which they settled was sand first, then silt, clay, and finally muck. The sand settled so quickly it was impossible to get a picture with it still in suspension. The silt followed soon after and then took a period of time to fill in the spaces between the sand particles. Clay can be seen in suspension in Hour 6 but has cleared in Hour 24. The calculations predicted that the muck would have settled in 22 days. While most of it cleared by the 21st day, the picture taken on the 100th day shows that there are still particles in suspension. ​Lastly, in both jars there is a layer of organic matter floating on the surface. These particles have made no downward movement through the time period. The jars will continue to be monitored to determine whether the colour clears from the jar containing the muck soil. 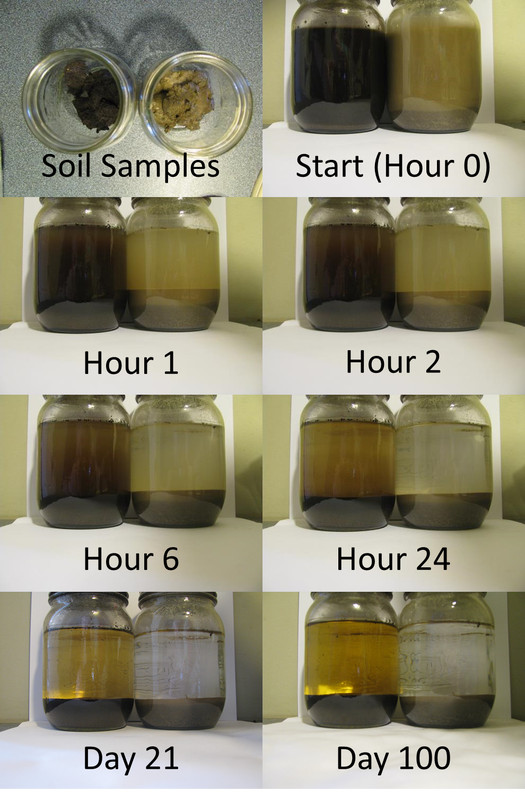 Figure 2: Size and specific gravity of sand, silt, clay, and muck, and the average time to settle 2 1/8"
News Release: "Technology Investigation: Coagulation & Flocculation"
The HMGA Water Project evaluated coagulation and flocculation systems for removing fine solids from washwater. They were used in conjunction with large solid removal technologies and compared to other systems with no added chemicals. A summary of the tests and results are available in the article below.